Welcome back to the Sarna.net interview with Catalyst Art Commander Brent Evans. Last time we touched on his background, the massive body of prior work they have to maintain and expand upon, and the exacting standards by which he must set for the artists. Let’s jump right back where we left off. Brent: You can see why most artists when confronted with those requirements end up running for the hills. Most artists don’t have the chops. 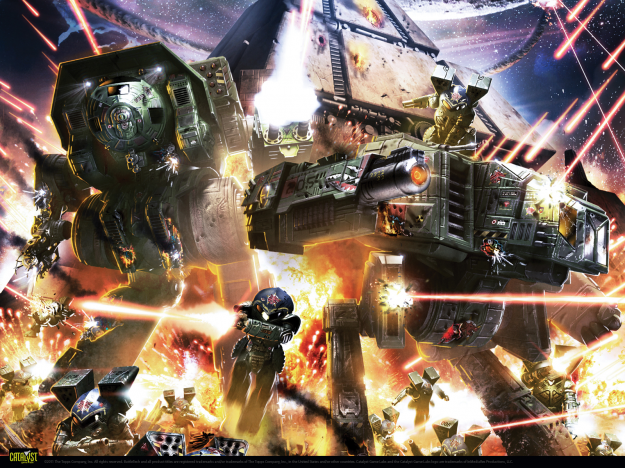 DeviantART is full of great artists (and yes I do mine it) but being able to create a cool ‘Mech picture does not mean someone has the chops to stand alongside Plog, Chris Lewis, David White or Anthony. The only folks who are actually happy working like this are those who do if for the pure love of BattleTech. Ron: Anthony is definitely a big fan. To bring this full circle Anthony is a great example of a new generation of BattleTech artists here at Catalyst. 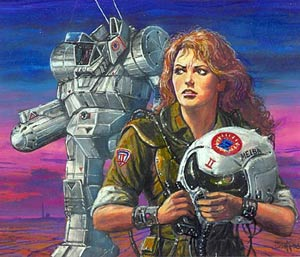 BattleTech had long relied on Doug Chaffee for good reason, and when he died in 2011 it rocked us profoundly. Doug was an artistic juggernaut who loved this property deeply and his passing left a hole in our creative team like no other. God I miss that guy. How do you replace a Doug Chaffee? The truth is that you don’t. You can’t. And no artist can be given that responsibility… which was why it was so incredible to have several guys step into the gap over the next year and take on art assignments that would have normally gone to Doug. Let’s face it, Doug left some Zeus sized shoes to fill. Or would have gone to one of us core guys when we were stepping into Doug’s shoes. Alex and Franz stepped in on covers (which was awesome) and Plog, Chris, David and I took what we could – but then we had guys like Anthony Scroggins, Justin Nelson, Rudy Vale, Stephen Huda, and Chris Daranouvong picking up work like the true fans they all are. I love that they all bring their own unique twists and flavors to the universe because they are always true to BattleTech, and that’s what matters. Ron: I will definitely keep that in mind. It might be too subjective, but what do you look for in an assignment that stands out that makes you either call for a revision or “That’s It!”? Jump Jets, not for those with a poor sense of balance. Ron: Do you have a personal favorite design or piece of work that you did? Others? Brent: Work that I did? I’d have to go with designing the Word of Blake Celestials and the Clan Wolf units for MechClix (Warwolf, Wulfen & Black Wolf Battle Armor.) The creative process was awesome, the villain and hero status’ of what they were was just awesome, and the results are just fantastic from a design viewpoint. I loved every minute working on them. Work that others did? Ah man there are sooo many. Doug Chaffee’s original Mad Cat painting for the original CCG was amazing. Komarck’s cover of the MechWarrior pulling his buddy from a smashed cockpit was just awesome. And the StratOps cover. Alex’s TRO3067 Reprint cover… but by far my all-time favorite is Neil Roberts’ cover for Wars of Reaving. I could stare at that all day. You know it’s good art if the firefight makes your ears ring. 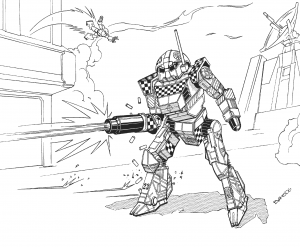 Ron: I think it was Herb Beas in his June 15th online chat that mentioned that the Dark Age Wiz Kids ‘Mech designs would be kept unaltered in the 3145 series of TROs despite the departure of some of them from earlier artwork out of fear of alienating the fans first introduced to BattleTech. Why is that? Brent: Oooh that’s a good question. I won’t speak for Herb, but will simply offer my own input here. Part of this was purely organic with regard to the unit’s place within the Universe (like the BearCub being the predecessor to the Arbalest), and part of it has to do with treating the Dark Age fans with respect. The Dark Age polarized the BT fans into either love ’em or hate ’em, with very little common ground. That said there were huge numbers of younger fans whose first introduction to BattleTech came through the clix game. Whether or not the longtime fans liked the idea of piloting a ForestryMechMOD against a never before unseen Vulture, the Dark Age happened. It is cannon. No handwavium is going to make it disappear. The only way to deal with it – that is true to fans at both ends of the spectrum – is to write them in and do it right. When it comes to game design there are some rules that must never be broken because they will absolutely kill the experience for the player. One of these key rules is “Never take something away from a player that they’ve earned – especially if they have no way to stop you.” In this case that means the minis that they held in their hands and played against their adversaries. It would be wrong to take them away or treat them disrespectfully in canon. Ron: Is the look of the old and new equipment likely to change a lot when the new era launches? Brent: New era? I assume you mean what happens after Bonfire of Worlds, and the answer is yes. 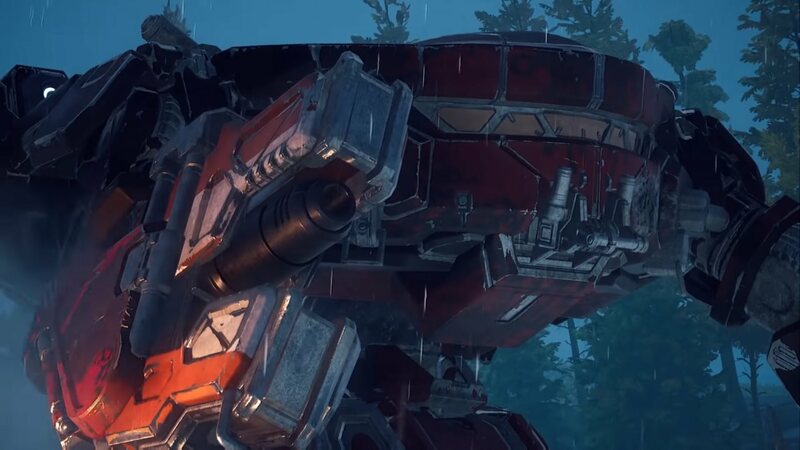 The Dark Age aesthetics are a mix of classic and the utilitarian efforts of Stone’s reforms – both of which will be forged in mankind’s thirst for something bigger, cooler, stronger, faster… Expect that to cue a whole new era of ‘Mech warfare. You’re gonna love it! Ron: Is there anything you would like to add that hasn’t been covered before? Brent: I love sarna.net and I’m on it every day. Great site! Its good to know we’re being noticed here. I just had no idea how far up the totem pole some of the readers were. This entry was posted in Catalyst Game Labs, Interviews and tagged Artists on 2013/07/25 by Ron. How do you replace a Doug Chaffee? You have to replace Doug Chaffee with three other artists. That’s how good he was. Actually, my math is wrong. I just recounted, and it took TEN artists to fill the void left by Doug Chaffee! TEN!